A SpoofGuard Policy describes the type of administrative action that should be applied to vCenter virtual networks. The three modes of operation for SpoofGuard for any network is Disabled/Inactive (DISABLE), Trust On First Use (TOFU), and Manually Inspect and Approve IP Assignment (MANUAL). The default policy in SpoofGuard is called “Default Policy” and its Operation Mode is Disabled. Updating the Default Policy or adding a new SpoofGuard Policy allows you to apply a SpoofGuard Operation Mode to specific vSphere vCenter networks to allow for administrative control of network access. All vSphere network types can be used in a SpoofGuard policy including vSphere Standard Switch (VSS) Port Groups, vSphere Distributed Switch (VDS) Port Groups, and NSX Logical Switches. SpoofGuard enforcement is on the vNIC of each virtual machine at one of the first slots or tap points before the NSX Distributed Firewall. The WebAppDB Policy is applied to Logical Switches Web-Tier-01A, App-Tier-01A, and DB-Tier-01A with the Operation Mode of MANUAL. This ensures any virtual machines connected to these networks cannot obtain network connectivity until they are “approved” by SpoofGuard. The Default Policy has an Operation Mode of DISABLE which ensures virtual machines connected to other networks in this environment do not have SpoofGuard policy applied. Querying information about a specific SpoofGuard Policy requires knowledge of the policies Object ID. This would normally be derived programmatically at time of creation. Since we queried all SpoofGuard Policies in my lab, we know that object id spoofguardpolicy-1 and spoofguardpolicy-2 are defined. A little gotcha, for Logical Switches, we require the NSX Logical Switch name and NSX virtual wire id which is different than the vSphere MOB name for the the same switch. NSX Logical Switch Web-Tier-01A has a virtual wire id of virtualwire-2 which is different than it’s MOB id. vSphere SOAP API, XML scraping the vCenter MOB, or PowerCLI can be used to obtain MOB id for vCenter objects. 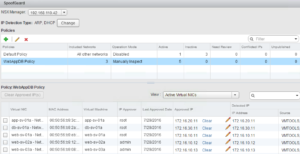 NSX REST API can be used to find virtual wire id’s. Note, SpoofGuard Polcies cannot contain the same networks. An error will be returned if an attempt is made to create or update a policy with a network already defined in an existing policy. Operational Mode of DISABLE, virtual machines have full access to the network switch and changes can be made to the virtual machines MAC and IP address. Operational Mode of TOFU, virtual machines have full access to the network, but any change to the virtual machines MAC or IP address will disable network switch access. Operational Mode of MANUAL, virtual machines have no access to the network switch until access is administratively approved via the SpoofGuard UI or API. As soon as a virtual machine is created (powered off) within vCenter, SpoofGuard learns of its interfaces and MAC addresses via vCenter. 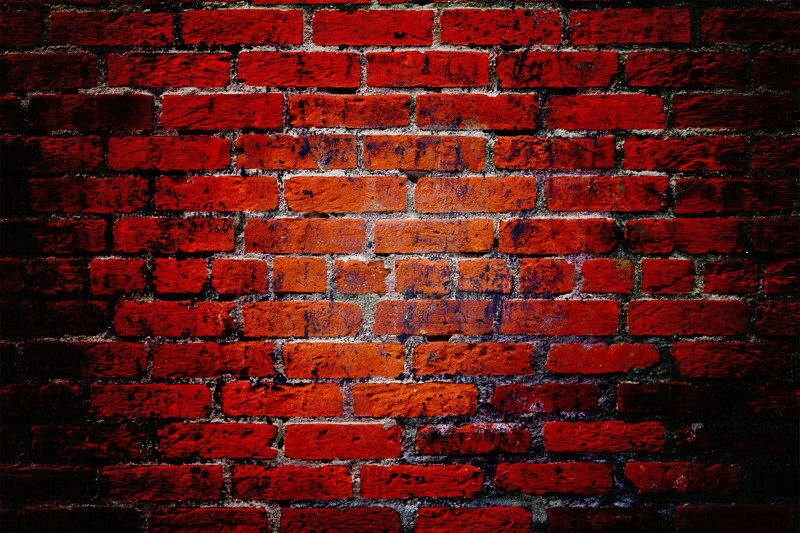 You cannot populate SpoofGuard with an IP and MAC address approval before the virtual machine has been created as SpoofGuard requires VM and vNIC MOB UUID information. For demonstrated purposes, I cloned web-sv-02a to web-sv-03a while both virtual machines were powered off and SpoofGuard immediately identified the new web-sv-03a. The Response Body will be an XML listing of all the inactive IP address approvals. Note the vCenter virtual machine MOB id information for VM’s listed… Note I have truncated the list to only include web-sv-02a and web-sv-03a. As shown in the Response Body, since web-sv-03a has never been powered on, there is no IP address information for this virtual machine – Much less detail is known by SpoofGuard for web-sv-03a than for web-sv-02a. Using the above method, I approved and published the IP and MAC address of the new virtual machine vm-sv-03a. This was a clone of web-sv-02a and the MAC address was refreshed with a unique MAC address as part of the Cloning process, but the IP address needed to be updated via the VM console. 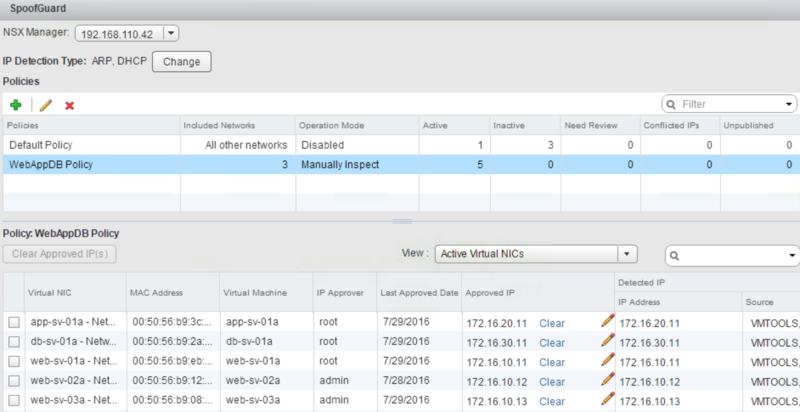 This demonstrates using the NSX API, SpoofGuard approvals of new virtual machines can be performed programmatically. Missing from the API Manual and I am working to get an update on this. SpoofGuard is tracking all virtual machine network interface UUID information irrespective of whether spoof guard policy is being applied or not. As such, SpoofGuard can be queried programmatically to obtain the virtual machine UUID which then can be used to connect a virtual machine to a logical switch.